If you’ve ever tried to find cheap parking at Fenway Park, you know what a challenge it can be. On top of that, Boston isn’t the easiest city to drive in (that’s probably an understatement), which is part of the reason most fans use the T to get to Fenway. Actually, it’s not that Fenway doesn’t have a lot of parking options. It’s just that they’re mostly bad ones. The lots closest to the park get jammed bumper to bumper, with cars stacked on top of one another at times, the prices for most of the closest lots…and even some not so close ones…are through the roof, and the traffic getting out afterwards can be exasperating too. 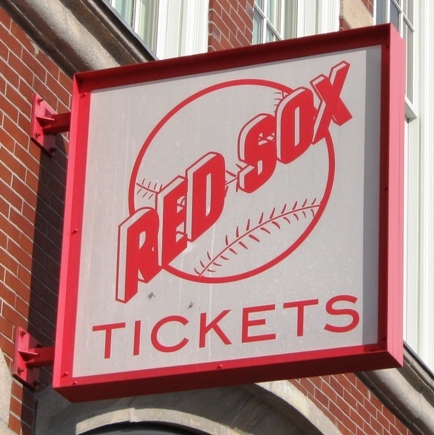 Cheap Parking at Fenway Park, Tip #1: The 100 Clarendon Street Garage. The 100 Clarendon garage is the “official” Red Sox parking garage, even though it’s about a mile walk from Fenway. It’s a sizable garage that usually has plenty of spots. 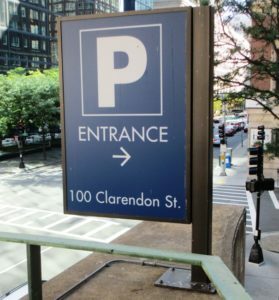 You can book parking for the 100 Clarendon garage on the Red Sox website; by Fenway standards the price is fantastic. Just print out your reservation and take it with you and you’ll have a spot for the whole game. It’s a fine walk through Boston streets on a nice day, but if the weather isn’t great, you can take a Commuter Rail from the Back Bay Station to Yawkey Station near the ballpark and back. Back Bay Station is literally across the street from this lot’s entrance. It’s actually probably the second or third best deal in town. 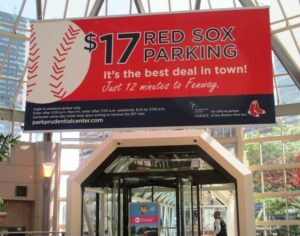 Cheap Parking at Fenway Park, Tip #2: The Pru Center. Like with the 100 Clarendon garage, this garage is very close to the Back Bay T station, so if you’re not up for the walk after the game you can use the Commuter Rail from Yawkey. Or use the Green Line Prudential station, transfer at Copley Square and take the B, C, or D to Kenmore Square. There’s a couple of nice things about the Pru Center parking. At Fenway, for one, most lots within a block cost almost three times the price. Another thing is that the place is full of eateries and sandwich joints to fill up your doggie bag, and the other is that you know exactly where to go after the game…the Pru Center building is visible from anywhere on the home or first base side of the ballpark. Given the choice, I prefer the 100 Clarendon Garage, but the Pru Center is a good second choice. It gets some not so great reviews, but I’ve noticed people using it for Red Sox games don’t complain much. Hmmm…what does the “P” stand for? Cheap Parking at Fenway Park, Tip #3: The Hynes Auditorium Garage. The Pilgrim Parking people operate a few garages in the Boston area for theaters and medical centers and such, and they make the Hynes garage (50 Dalton Street) available for Sox games for about the same price as the Pru Center. It’s right across the street from the Pru, a scoche (did I spell that right?) closer to Fenway. The Hynes garage is only available on weekends, and like with the Pru Center you’ll need your ticket, but it’s near the Pru Center and its shops and it’s also a short walk to the Hynes Center T station, where you can hop on a green line train to Fenway or back should the weather be uncooperative. It’s also a good spot to find a Boston Pedicab. Like I said, these lots aren’t the closest, but it’s well worth the walk for the lack of extortionate prices and aggravating congestion. And even if you use the Commuter Rail from Back Bay to Yawkey or back, the fare is cheap enough that you still come out ahead in the quest to find affordable parking at Fenway Park.